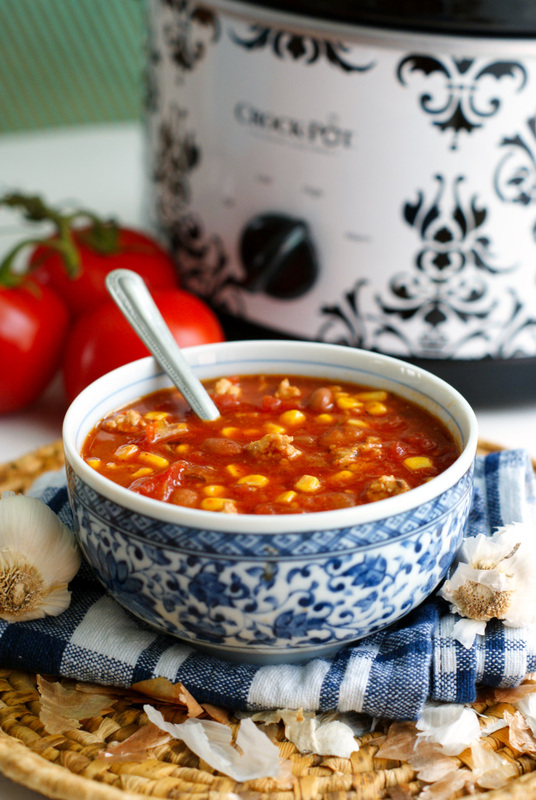 Easy Crock Pot Chicken Chili takes just a few minutes of prep then a few hours in the crock pot to make an easy and delicious dinner the whole family will love! This is going to go down as one of my all-time favorite blog posts. Not only is this recipe totally delish, but I had the pleasure of composing this entire blog post with my lovely daughter! Sure, we cook together often, but this particular recipe was made on National Take Your Child to Work Day! That's right, I'm a food blogging momma, so my girl got to be my sidekick for the day. She learned about writing a recipe, cooking, food styling, and photography...just some of what I do around here as a food blogger. We had a ton of fun and I love that she got to take a closer look at what I really do while I'm "working." Because, I'm going to be honest here, sometimes my work looks a lot like play. Food blogging is the best job ever, just in case you didn't know, and I was super stoked to fill my girl in on some of the behind the scenes nitty gritty. 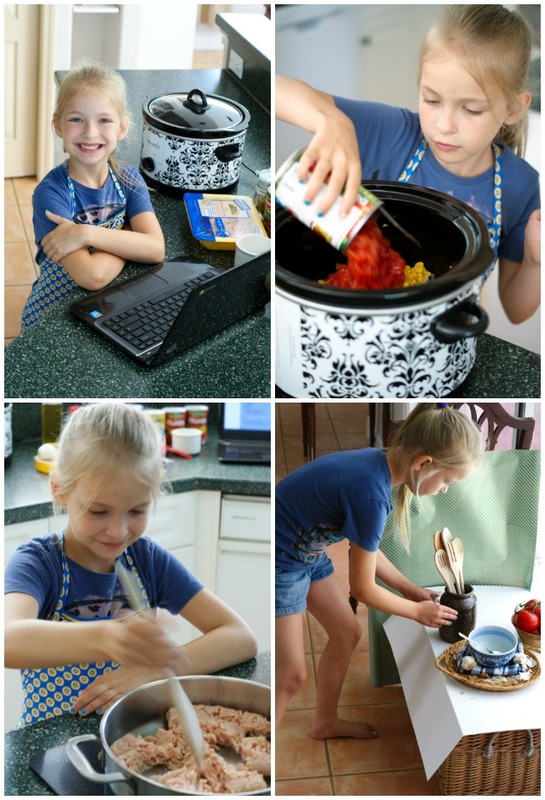 I've been kicking around this recipe in mind for a while, and I knew that with my daughter as my sous chef, it would be perfect for our day in the kitchen together. 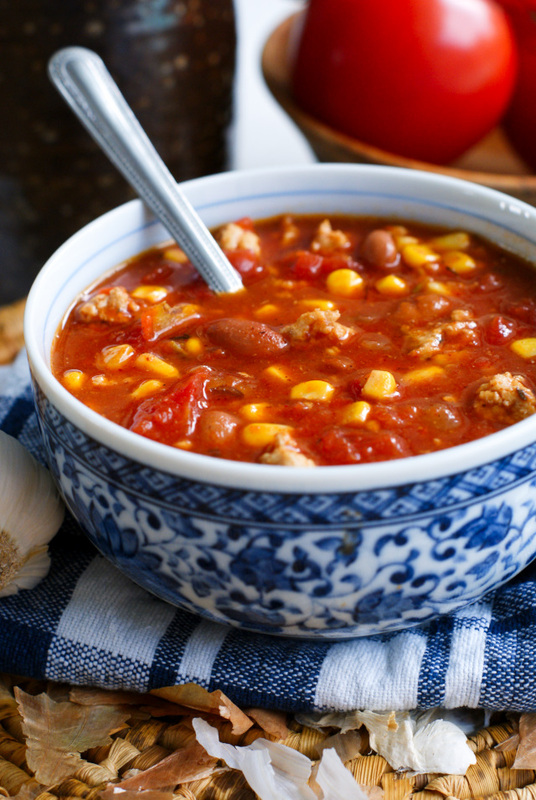 This chili is super easy to make and it matched up with her kitchen skills just right. She's pretty handy with a chef's knife and had no problem browning the meat and dumping the cans. I let her do most of the cooking herself and we talked our way through the recipe. We tasted, seasoned, adjusted, and tasted again. This was a great recipe for her to work on with me because sometimes she shies away from more bold and flavorful seasonings. I wanted her tasting some things that had a little zip. She didn't hesitate to dig right in and we talked about how sometimes foods and spices can tingle your tongue a little and be flavorful without actually being too spicy. She was brave; I was proud. Once we had our chili simmering, we moved on to setting up for our photos. She's seen me do this literally hundreds of times and I could tell she was thrilled to be able to do it all on her own. I let her choose whatever she wanted from my arsenal of food props and she styled the shot entirely by herself, right down to the wrapping paper background and garlic cloves alongside the bowl. She took it very seriously and I resisted the urge to correct or suggest anything so that she could really have complete control over everything. Food blogging is an art, after all, and this whole day was about teaching her that. When the chili was finally done, we got to take the pictures! The kids know my camera is off limits, so this was a pretty big deal. I'd say she's giving me a run for my money! I couldn't let her have all the fun, so I snuck in a few shots of my own, too. At the end of the day when we sat down to dinner, I could see the pride beaming from her face as her dad told her he thought that her chili was definitely better than mom's. I conceded, and I told her that I thought it was amazing. It totally was. This chili doesn't boast too much heat, but it's def got a bit of zing. The sweet corn and a dollop of Greek yogurt compliment the bold flavors perfectly. National Take Your Child to Work Day was a success for both my daughter and me. Sometimes I get crazy stressed with the whirlwind that is this blog, but I never ever forget that I blog what I love, and I love what I do. Any time that I can encourage my kids to follow their dreams, be independent, and do what they love, is a win. This day was a win, the memories we made are totes a win, and this recipe is a sure win. It doesn't get better than that! In a large skillet over medium-high heat, cook the onions, garlic, and ground chicken in the olive oil until the chicken is no longer pink and the onions are translucent. Transfer to a 4.5-6 qt. crock pot. 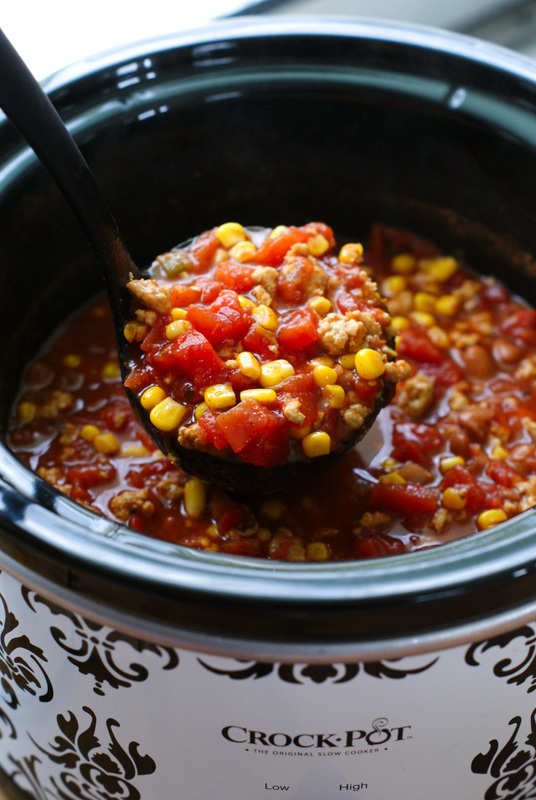 Add the chili powder, cumin, oregano, salt, corn, beans, and tomatoes to the crock pot. Stir to combine. Cover and cook on high for 3-4 hours. 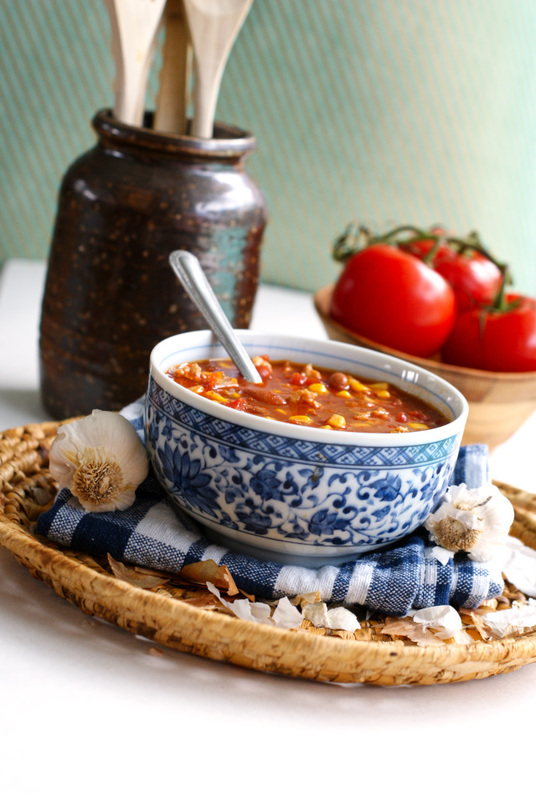 Top your chili with all your favorite fixins! We like to top it with shredded cheddar cheese, Fritos, and a dollop of plain Greek yogurt. If you like a slightly thicker chili base, try mixing in some refried beans to thicken it up! Source: Adapted from a recipe my friend gave me years ago. Thanks, Ang!